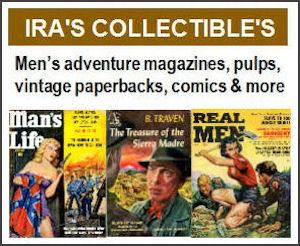 The late Norman Baer was one of many highly-talented illustration artists who worked for men’s adventure magazines during part of their careers. As noted in the previous post here, Baer created artwork for men’s adventure magazines from the mid-1950s to the early 1960s, before moving on to become a popular teacher at The Art Institute of Boston and an advertising and storyboard artist. There’s not much information about Baer online and only one article I could find includes an interview with him. It was published in the Phoenix New Times newspaper in 2001, ten years before Baer died. One of the things that stuck out to me in that article is what Baer said about the influence of movies and theater on his work. Illustrations done for men’s adventure magazines are generally very dramatic and cinematic. Many are clearly influenced by the lighting and camera angles used in mid-20th Century movies and the posters created for them. 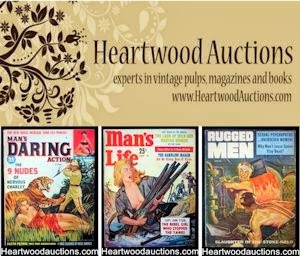 In fact, several of the best known artists who worked for men’s adventure magazines, such as Frank McCarthy and Mort Kunstler, also did movie poster artwork. 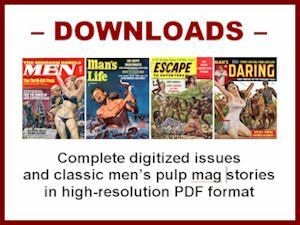 Baer told Phoenix New Times writer Dewey Webb that he was attracted to drama from an early age and that black-and-white noir films of the 1940s had an especially big impact on his men’s pulp-era art. That’s evident in many of the interior illustrations he created for the top tier men’s adventure magazine CAVALIER. Most of Baer’s CAVALIER illos were for noirish crime, mystery and detective stories. From about 1958 to 1962, he was one of the magazine’s go-to artists for such stories, in the same way that artists like Frank McCarthy and Harry Schaare were the top picks to do illustrations for CAVALIER’s outdoor adventure, war-related and Western stories. Baer’s artwork was used for most of the hardboiled Mickey Spillane detective stories published in CAVALIER during those years. He was also picked to provide illustrations for several of the Richard S. Prather’s Shell Scott detective stories published in the magazine and chillers written by Roald Dahl (who is best known for his quirky children’s books, but who wrote much darker stuff for adults). Baer may have misremembered how many camera shots of Greenstreet were taken from below in that 1941 film noir masterpiece. But you can see a direct relationship between the camera work and dramatic lighting of classic noir films and Baer’s illustration art for CAVALIER (and other men’s adventure magazines). In the Phoenix New Times article, Baer also credits the dramatic lighting of stage productions as an influence. His wife Catherine was an actress who worked in off-Broadway and stock theater productions. I think most of the best interior illustrations Baer created during his men’s adventure era were for CAVALIER. Indeed, the art directors for CAVALIER liked Baer’s work so much that his illustrations were sometimes used for more than one story in an issue. In 1960, that story was adapted for an episode of ALFRED HITCHCOCK PRESENTS. Hitchcock’s version starred Steve McQueen and Peter Lorre. If you haven’t seen that ep or want to see it again, you can now watch it on YouTube. Norman Baer didn’t do any CAVALIER cover paintings that I’m aware of. 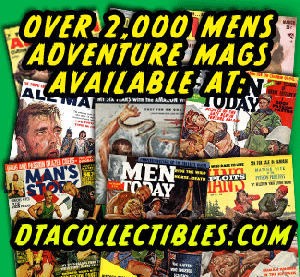 But he did do some covers for men’s adventure magazines published by Martin Goodman’s Magazine Management company. 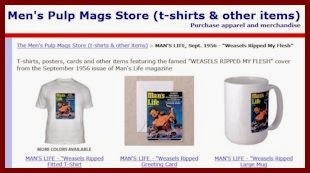 We’ll take a look at some of those in the next post on MensPulpMags.com.